MainAll NewsInside IsraelEnd of the Samaria water crisis? Water Minister Yuval Steinitz describes the emergency measures taken to break the water crisis in Samaria. 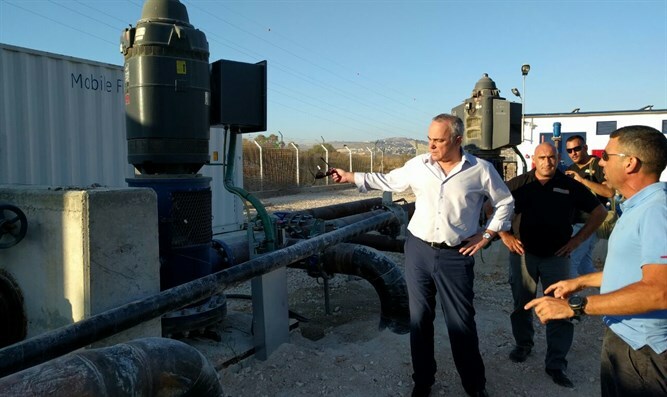 Infrastructure, Energy and Water Minister Yuval Steinitz (Likud) visited Wednesday the drilling site which is expected to resolve the water crisis in Samaria. Samarian towns, both Jewish and Arab, have been suffering a severe water shortage this past month. The drilling site, "Ariel 1," will tap into local ground-water resources, as a short-term solution for regional thirst. During his visit, Steinitz commented, "The site is expected to send water to the [regional] infrastructure in the near future, and fill the short-term need for both settlers and Palestinians. "At the same time, the Energy Ministry is working on long-term solutions in order to provide adequate water for the growing consumption needs in the region," he reassured. In the past, Steinitz told Arutz Sheva that a solution would consist of adding and improving water storage tanks for the cities and towns of Samaria. He also had commented on the need to speed up the time-table for the "Ariel 1" drilling. Israel imported from Great Britain a giant filter, roughly the size of two large trucks. It was immediately installed at the site, in order to sooner bring drinkable water to the area. When pressed for the reasons for the water crisis, Steinitz commented: "All this came from no one taking care of the water infrastructure, while the population grew." He also noted that farmers in the region have planted more vineyards, which require a lot of water. "Therefore, I am working on an immediate emergency plan, and we'll also work in the long-run on a masterplan which will double the water pumped to the Samaria region, enabling the growth of settlements in the future, without them finding themselves in a situation of crisis." כמו כן הזכיר אז בדבריו את זירוז קידוח ''אריאל 1''. לשם כך, סיפר השר, מובא ארצה מבריטניה מסנן ענק בגודל של שתי משאיות ענק, ועם הגעתו הוא יותקן בקידוח שיאפשר זרימת מים ראויה לאזור זה.